Macy’s, Amazon and Dollar Tree are the most recent companies that have announced plans to build distribution centers in Ohio. They join companies like Home Depot, Hayneedle, zulily, Restoration Hardware and McLane Co., which already have significant distribution operations in our state. Why do these companies want to put their distribution facilities here, in Ohio? Because Ohio makes it easy to move goods where they need to go. As e-commerce continues to grow, retailers want to move closer to dense population centers where most of their customers live. Ohio fits the bill, with three major metropolitan areas – Cincinnati, Columbus and Cleveland – as well several smaller metro areas, including Akron, Dayton, Toledo and Youngstown. And it’s within a day’s drive of 60 percent of U.S. and Canadian markets. Ohio’s proximity to customers provides a clear advantage for companies involved in e-commerce and logistics and distribution. 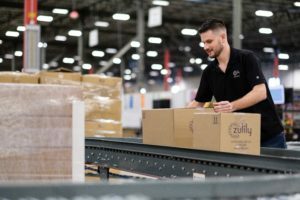 Six distribution and processing centers owned by the nation’s four largest delivery companies (UPS, DHL, FedEx and the U.S. Postal Service). An integrated transportation system with 6,820 miles of interstate highway, 13 intermodal facilities and 10 major rail yards. Maritime transport capabilities via Lake Erie and the Ohio River. A location conveniently situated between both coasts. A tech-forward environment exploring autonomous and connected vehicle capabilities. Nationally ranked supply chain management and logistics programs creating a constant flow of skilled talent. A low risk of natural disasters. These assets should make it easier to sell Ohio to companies looking for the best state to build or expand their distribution facilities.